In addition to helping all students communicate mathematically, the Project M² units also differentiate instruction to meet the needs of a range of students. Each lesson includes sections on how to support as well as challenge students. This section, in each lesson, provides ideas to help students who may need more practice or additional instruction with skills or concepts being developed. Some students may need experiences with skills or concepts that are assumed mastered or at least introduced earlier. suggestions on how to provide experiences with prerequisite skills or concepts. possible center activities that can provide experiences with prerequisite skills or concepts. Hint Cards that can be provided to individual students or, at times, to the entire class (on an overhead transparency) to move the students’ thinking forward and allow them to successfully engage in the unit’s investigations. 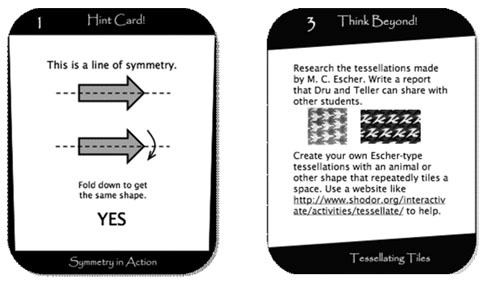 The Think Beyond Cards are a way to challenge your students who have demonstrated mastery of the objectives and for your mathematically talented students who grasp the concepts quickly. The questions on these cards focus on questions that promote high-level thinking and mathematical discussion. provide differentiation so students can work at their own level of understanding. are for students who have a firm grasp of the concepts presented in the lesson and are ready for increased challenge. ask students to expand their knowledge using deeper, more complex reasoning. can be used in lieu of or in addition to the Think Deeply question to write about in their Mathematician’s Journals. might be used to create a center for students to go to as an enrichment after completing other work throughout and after a lesson. A wide variety of cards at each level is included to make individualization easy and to provide the student who really develops an interest and love for the topic with some new rich experiences. 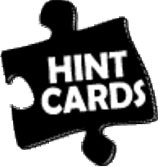 To enhance the learning experience for your students, we have provided blank Hint Cards and Think Beyond Cards in the Resources section at the end of each unit so you or your students can write your own.